It was deep in the interior of residential Nawalakoswatta that I had to delve into to interview the diminutive pleasant looking Shantha Kalavitigoda. I found him to be modest to a fault. He admitted that he still held the record for batting at the Ananda-Nalanda Big Match with a score of 149. This he achieved by beating Roshan Mahanama’s 144. He was also the 101st Sri Lanka Test cap; he played a solitary Test against New Zealand in New Zealand. Shantha also came up the ranks of junior cricket under 13 to under 15, he paid a big tribute to Leslie Narangoda (represented Nalanda from ’68/71) who was a committed coach, stated Shantha. Leslie was at the Campbell Place grounds devoting himself to his charges from 1 to 6 pm, 5 days a week, that was star class commitment. Shantha was a run machine at Nalanda notching 900 runs consecutively for four seasons. His heroics at Nalanda were overshadowed only by that Nalanda great Mahela Jayawardene. Incidentally the environs of Kuppiyawatta has produced many great cricketers both from Ananda and Nalanda, they all are well versed in cricket leave alone soccer or swimming for that matter. What more can be said about these boys, the first Test cricket captain Bandula Warnapura came from Nalanda and of course the World Cup winning captain Arjuna Ranatunga was an Anandian. After blazing a trail at Nalanda, SSC was waiting to grab Shantha. 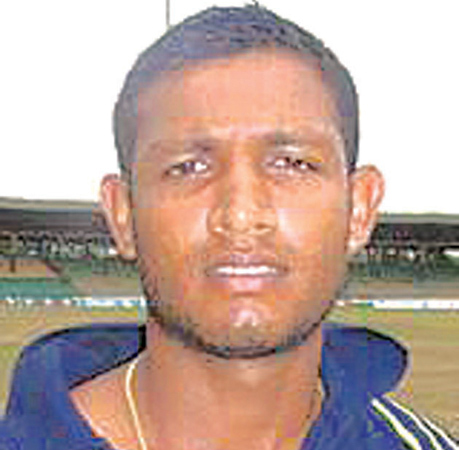 Mahela’s influence also mattered noted Shantha. He captained the under 24 Sri Lanka team and players of the calibre of Nuwan Zoysa, Dilhara Fernando and Suresh Perera played under him. He represented Sri Lanka A from 1996-2006. There again Shantha proved to be a patient accumulator of runs which is a dire need in Sri Lankan cricket at the moment. Whilst playing for Colts under the guidance of Roy Dias in 2003 and 2004 he became the Best Batsman in the Premier League. Tour money - Rs 5000/= per day for 30 days. Total is approx. Rs. 5 lakhs. After playing club and provincial cricket day in day out Shantha and Co. found no reward and hence the likes of Suresh Perera, Jehan Daniel have migrated to play cricket in Australia looking for greener pastures. Shantha had good results in the commerce stream getting 4 C’s in one go and could have entered University but opted for a banking career at Sampath Bank. At present he is the Duty Manager Kiribathgoda branch where he is happily employed for the last 20 odd years. Shantha stated that he worked with Don Anurasiri who was then at the Bank and they were given leave after 3.00 pm to attend practices. He noted that other banks such as Hatton National Bank and Seylan Bank also employed national players and at that time the number was about 20. Reverting back to the present fiasco, Shantha was of the opinion that there were too many changes in the national set up including the captains. “We were far too archaic in our cricket structure lamented,” Shantha. He observed that whilst the other countries have rapidly got accustomed to the modern trends in the tournament structure we are still sticking to the old system that he played in the 90’s. He was of the opinion that IPL was a good thing that happened to India. The main ingredient of a top class coach is to get to know the individual player and to motivate them and fine tune them. A coach cannot be responsible for the structure of a tournament, Shantha insisted and went on to state that a good structure could be put in place with the help of ex stalwarts with foreign exposure such as Chandika Hathurusingha, Mahela Jayawardene, Kumar Sangakkara, Roshan Mahanama etc. He was of the view that ex club cricketers opinions will not be of great value. Those days school cricket was the feeder for the national side, now times have changed expressed, Shantha. There should be a worthwhile tournament to accommodate players of ages 26-29yrs so that once they get tempered there, they are ready for national duty, ready to cope with any opposition, come what may explained, Shantha. Before ’96 there was talent but to no avail, they never had confidence in them and they were just playing second fiddle to “Suddhas”. Arjuna came and broke the ice and that was it. The present stance was that they must build pacer friendly wickets However Shantha was of the opinion that this is not a bad idea but the better option was to build the confidence of the players at this late stage. An absurd state of affairs was that Dinesh Chandimal the current captain after having a Test average of around 40 being left out of the proceedings and Shantha lashed out stating that how on earth can subordinates have confidence in keeping their places when the top man’s head gets chopped off. Shantha was also critical of the ‘A’ team having 40 players instead being pruned down to 20, he noted that this will lead to confusion which in fact is basic common-sense. At present the major tournament is flooded with runs, 100’s and 200’s were the order of the day and Shantha was of the opinion that low quality bowling has emerged due to net bowlers coming into the scene. He also stressed the fact that we need many players who could bowl at 145+, and since there is a dearth of such bowlers locally, it’s far better to bring down pacies from India, Pakistan and the West Indies and spend on them rather than spending on 200 odd coaches who are attached to SLC. Shantha had a strong point to prove! Shantha’s wife is a Legal Officer at the Petroleum Corporation and his two daughters attend Musaeus College.